Usually, I worry about our old pets as we head into winter. This winter was so harsh I'm surprised that more bad news didn't come. Counterintuitively it's been these recent days of thawing that have brought heartbreak. Last week Chili and her family said goodbye to Toeses. He lived to be 21 and one day, which is a damned good run but it is never long enough. 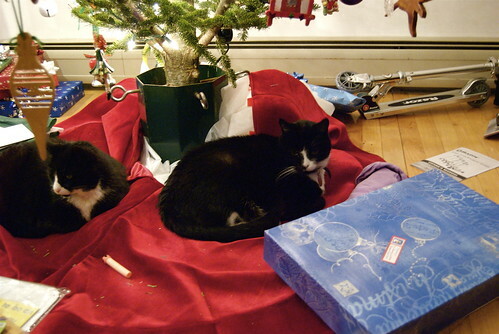 I believe he is the happy cat on the right in this pic I took in 2008 but I'll wait for familial confirmation. Last night unexpectedly our neighborhood matriarch, Lelu, passed away. She became ill in the evening and was rushed to medical care but they weren't able to help her. It's fortunate that she didn't suffer but it's a terrible and unexpected loss. Her head butting method of begging in the park will be deeply missed. You know the drill and how important it is. 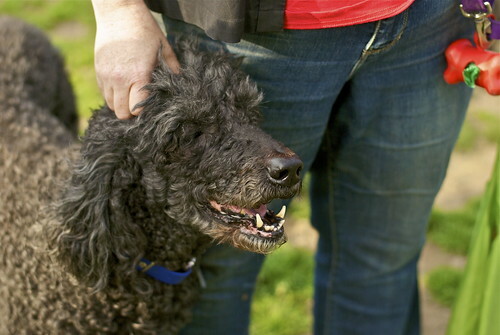 Please give treats to all your dependents just for being there. We will accept breathing as the most amazing trick today. Any signs of life are worth rewarding. Listen To Your Mother is coming up quick. May 4th, 5pm, Symphony Space. Buy tickets here. Learn about our cause here. Learn about our cast here. That's so sad. It's difficult when someone loses a family member. Extra treats for Daisy who never fails to bring a smile to my face. will do. all the fuzzies will be loaded with treaty goodness tonight.